Sweet Dreams Are Made of This, or, Strange Bedfellows.. In the years since her death in 1993, there have been attempts to deify Doris Duke as a style icon. Colorful she may have been, but for me, that ultimate refinement of eye just wasn’t there. However, with all that lovely lolly, she did manage to pick up a few interesting things along the way. 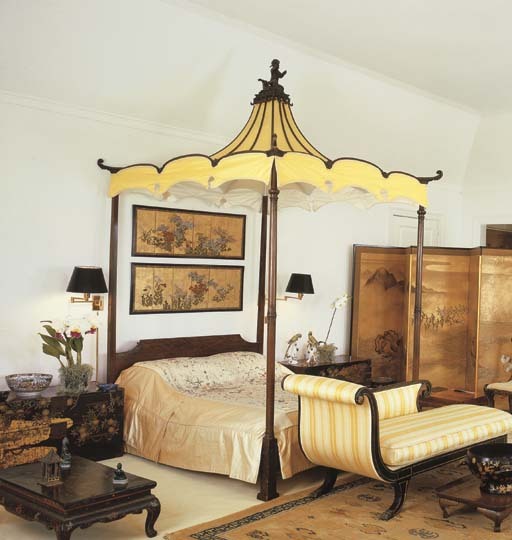 —Like this bed, sold at the Christies auction of her effects at Duke Farms a few years back. Wouldn’t mind having that in my inventory. 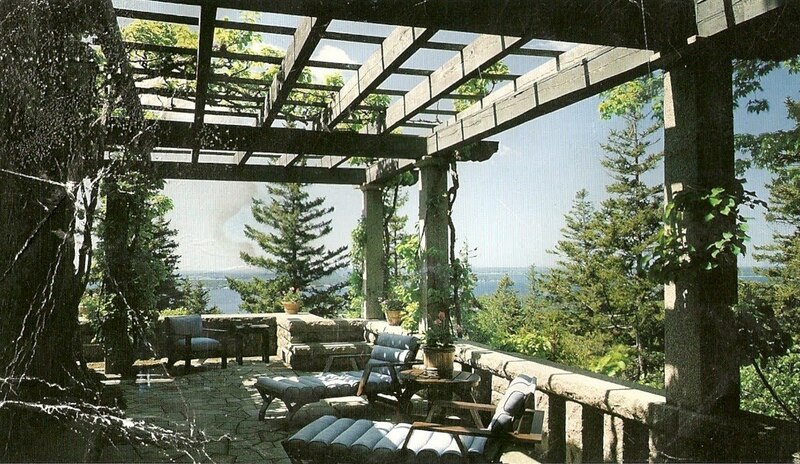 But, we’ve got some serious scale problems going on with the other stuff around it….and wouldn’t that chaise block the view of the fire in the Steuben glass framed fireplace? Edit, edit, edit. I finally got around to cleaning the desk. Deep in the back of a drawer was a wrinkled file of clippings from the 80’s. 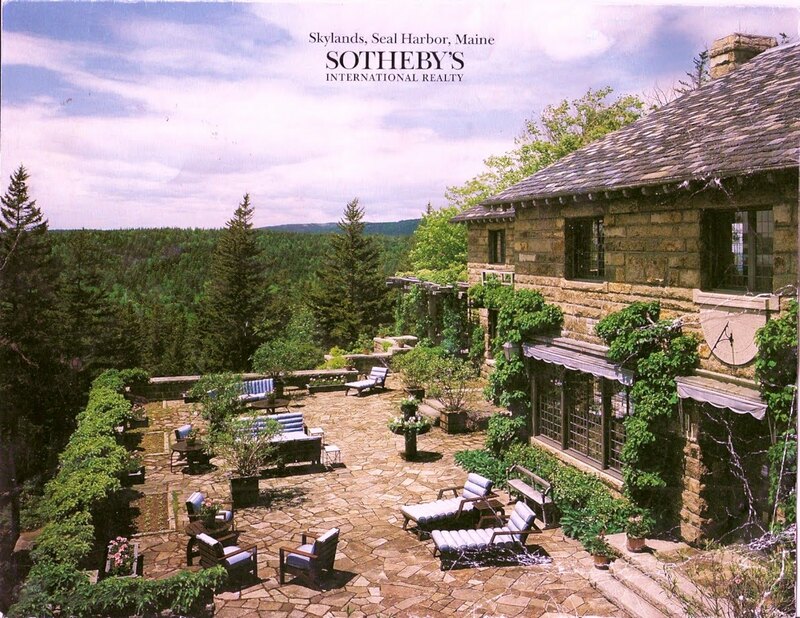 Among them was a real estate brochure for Skylands, the Seal Harbor, Maine home of Martha Stewart, a couple of years before she purchased it. The stories of Skylands are legion, and since most Martha followers can recite them as if liturgy—-the mile of pink crushed granite drives which are raked up, washed and stored every winter, the forest floors sprayed with buttermilk to encourage a mossy carpet, the superb craftsmanship, the heated drying cabinets for linens—the list goes on, and I won’t bore the reader with yet another repetition. Oops. I said I wouldn’t go on, but born pedant that I am, I just can’t help it. 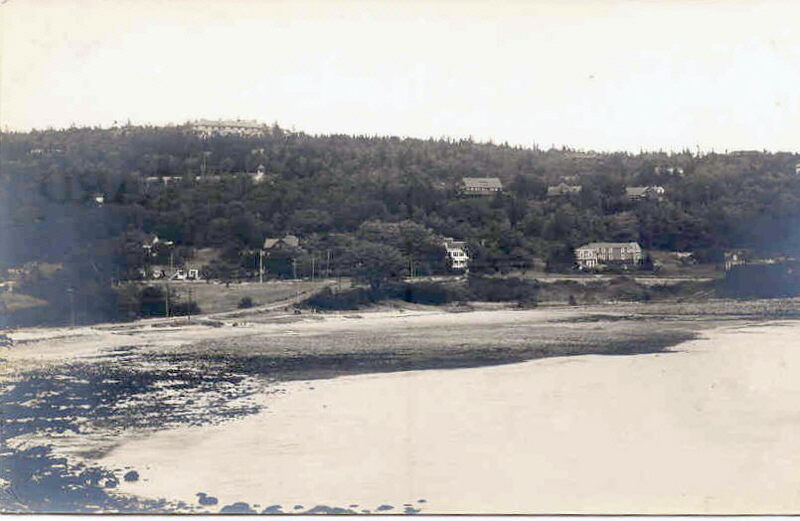 Herewith, the pictures (sorry for the wrinkles) from the real estate brochure. 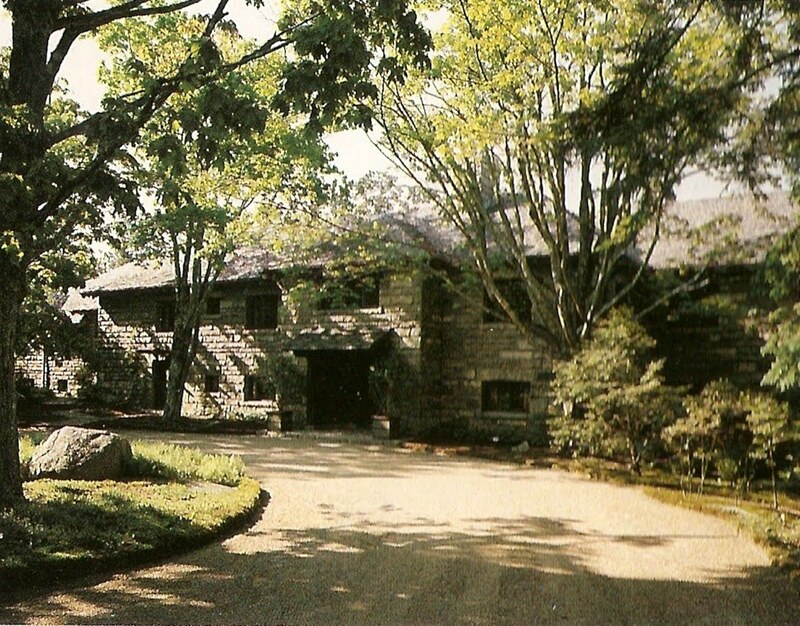 The house was at the time owned by the Leedes, who bought it from the Ford estate in the 1970’s. 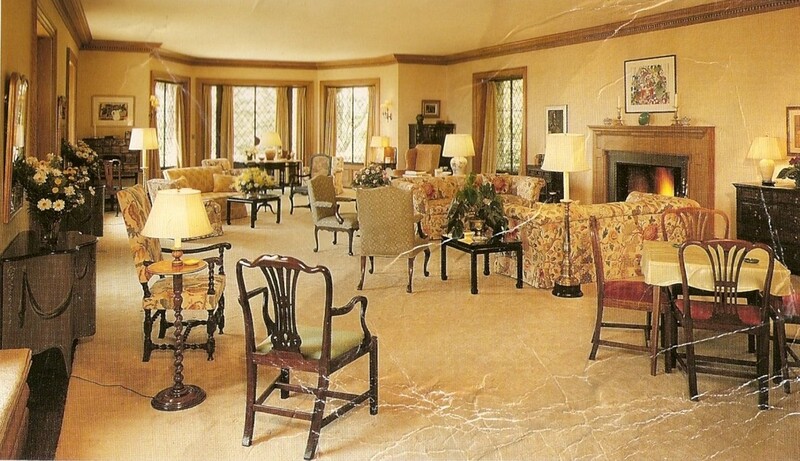 Though the house was not as lavishly burnished and maintained as in the Ford’s day (hot and cold running staff helped), the Leedes’ did regularly call in Mrs. Ford’s old decorators, the Palm Beach firm of Jessup, Inc. to keep things up. Although the Fords left their furnishings, they took the art, and the pallid framed pieces do not live up to the architecture. Very Wasp , very understated, slightly boring. Now, of course, the joint is just plain jaw-dropping. Everything perfectly maintained, the neglected landscape restored to perfection, and maintained beyond perfection. 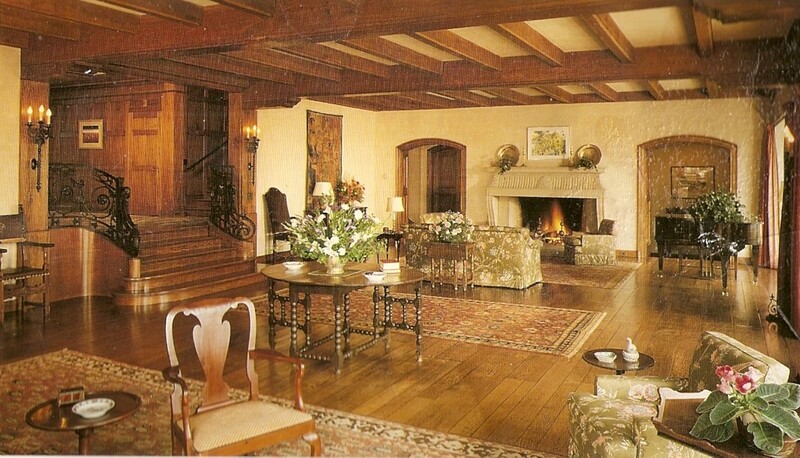 The paneled two story entrance hall leads into this living hall, with a fireplace carved of native pink granite. Sometimes, I do wander out of New England for material. Today we go to France, to the Moulin de Launoy. 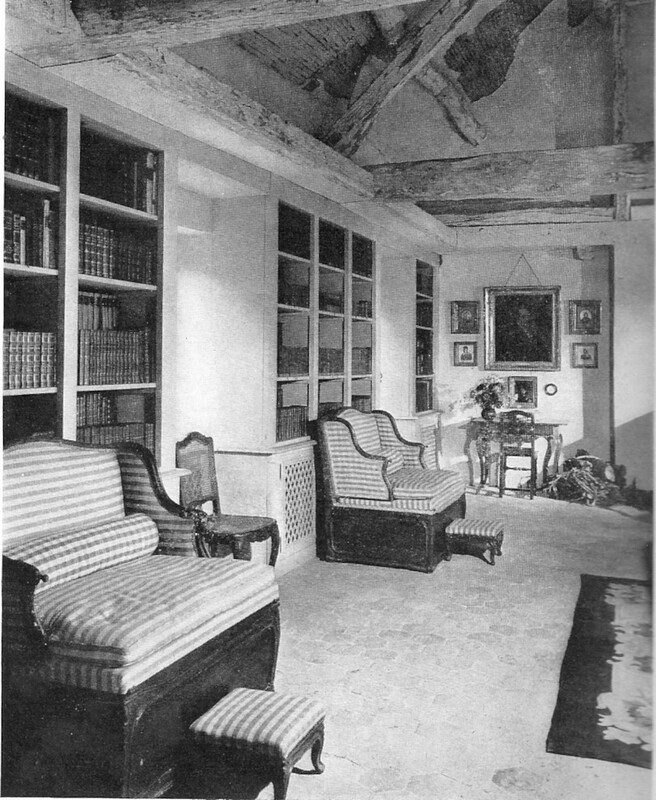 The Library in Moulin de Launoy, 1948. 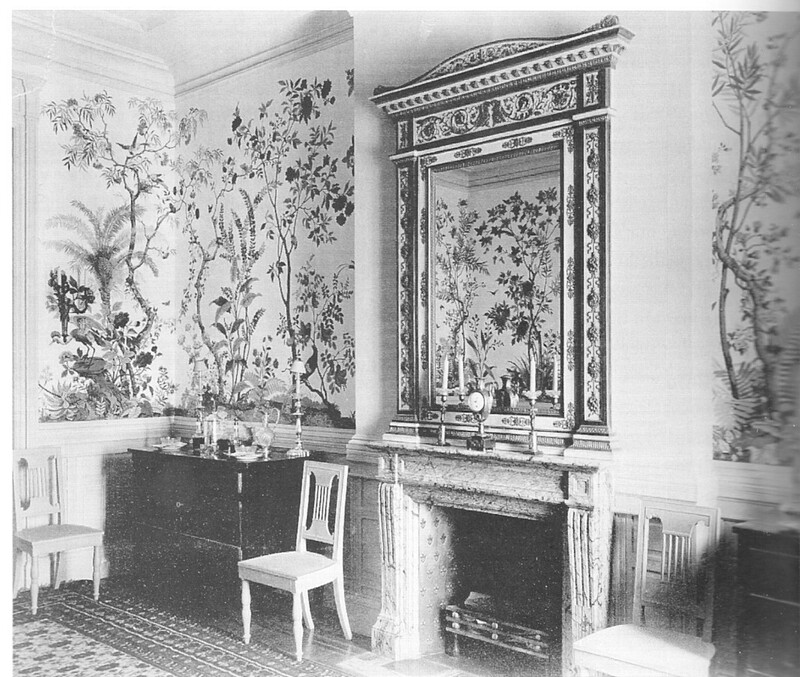 I first saw the picture above at the age of 12, in House & Gardens Second Book of Interior Decoration (yes, I was that sort of child, completely house obsessed). and it went through me like a lightening bolt. 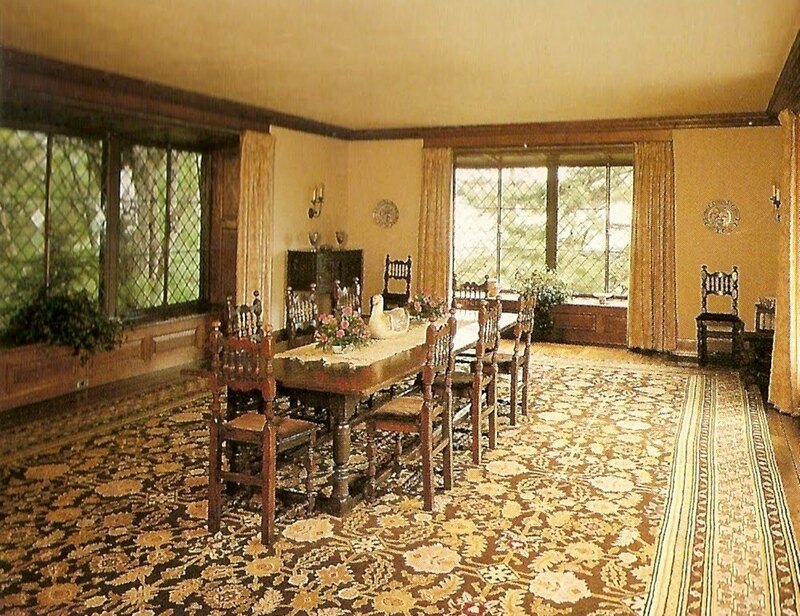 Here was something fresh and stylish, a real jolt to a sensibility reared in the New England of hooked rugs, tiger maple furniture and sandwich glass lamps (not a bad look either, in the right hands—look what Henry Sleeper did with Beauport). 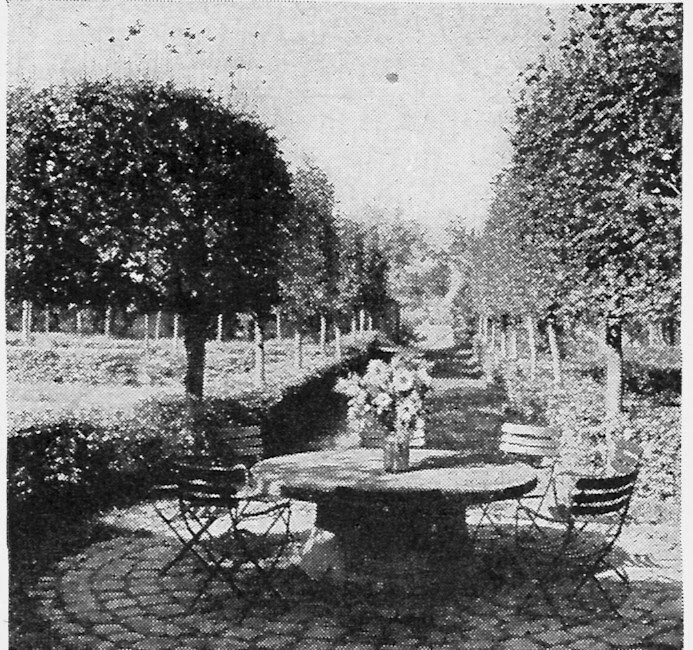 It was a new idea of France, for me without the gilt of Versailles. It did not hurt either, that the photographs were by the great Andre Kertesz.. I find this room amazing, and timeless, with its offhand mix of good furniture against rough walls, with the tile floors, even some lathe showing in the ceiling. Flowers are arranged casually in earthenware pots. Pattern is kept to a minimum. According to the article, the chalky walls have a barely perceptible pink-ish wash playing against the terra cotta tiles. No curtains to block the light. A few well chosen pieces of architectural salvage give distinction. The wide mantel of the dining room is very fine. 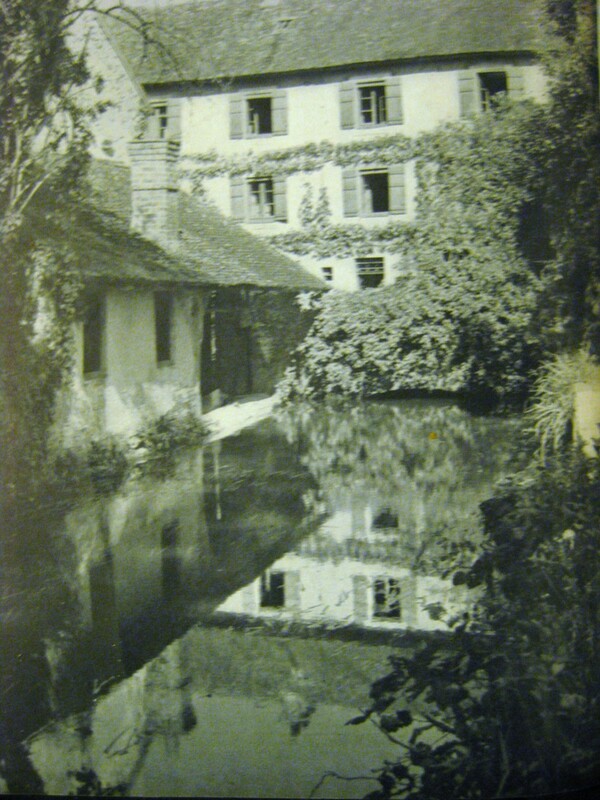 Compare this mill to the contemporaneous, nearly hysterical chicof the Duke and Duchess of Windsor’s Moulin. 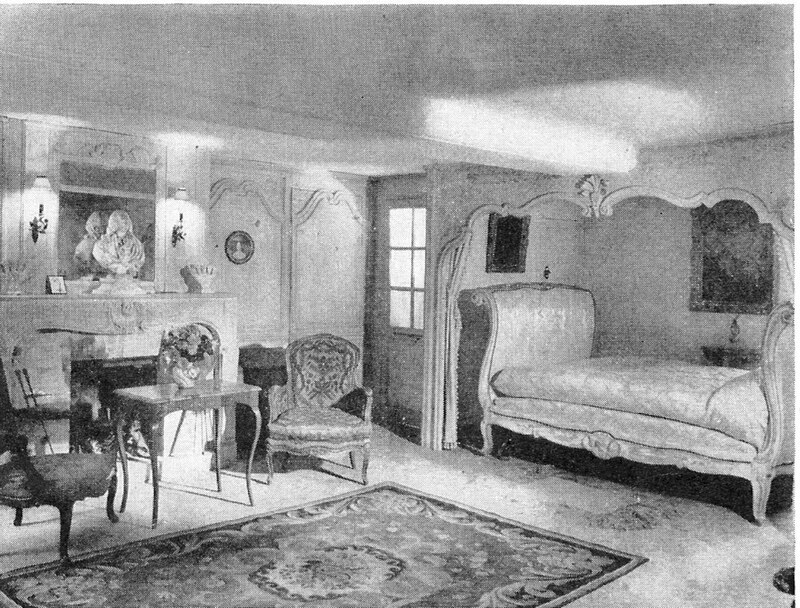 Here we have real style that answers to no one, completely unself-conscious, and it puts to shame most modern efforts at this sort of interior. The French have always excelled at this particular off-hand elegance—think Frederic Mechiche in his Provencal mode, for a modern comparison. The photographs were originally published in an article in House & Garden in 1948, in one of the handsomest issues that lamented magazine ever published (Two more posts forthcoming from that amazing issue). 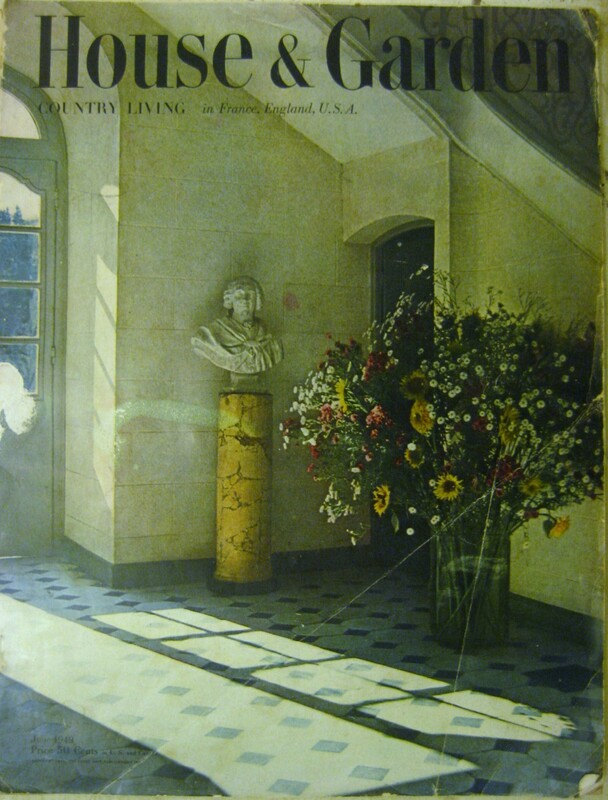 The cover photograph, of the de Monvel’s entrance hall, is hauntingly lovely. Mme. de Monvel’s bedroom, elegant boiserie cut down to fit low ceiling space, to great effect. 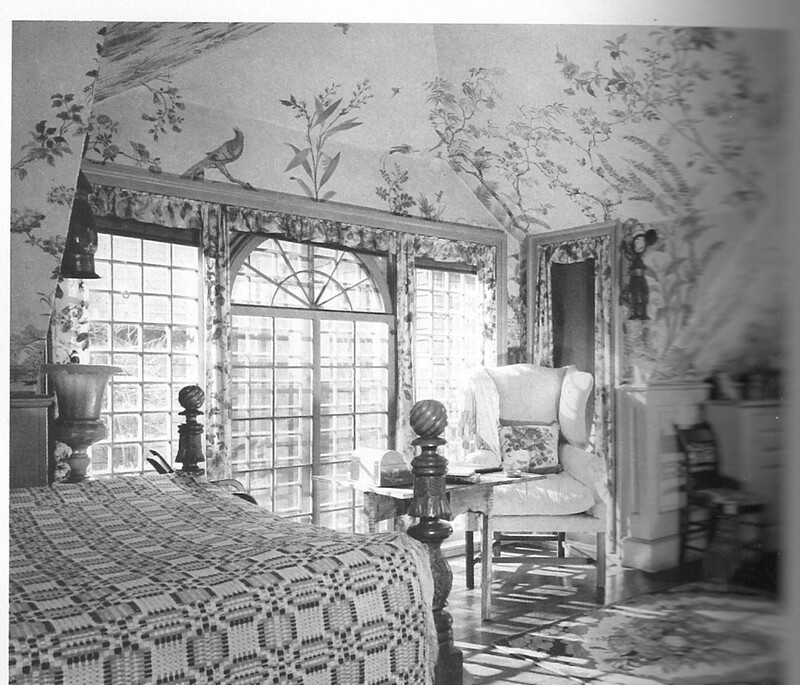 The post about the smalt room at the Warner House in Portsmouth has gotten so much email response that I am posting a couple more photographs for your enjoyment. 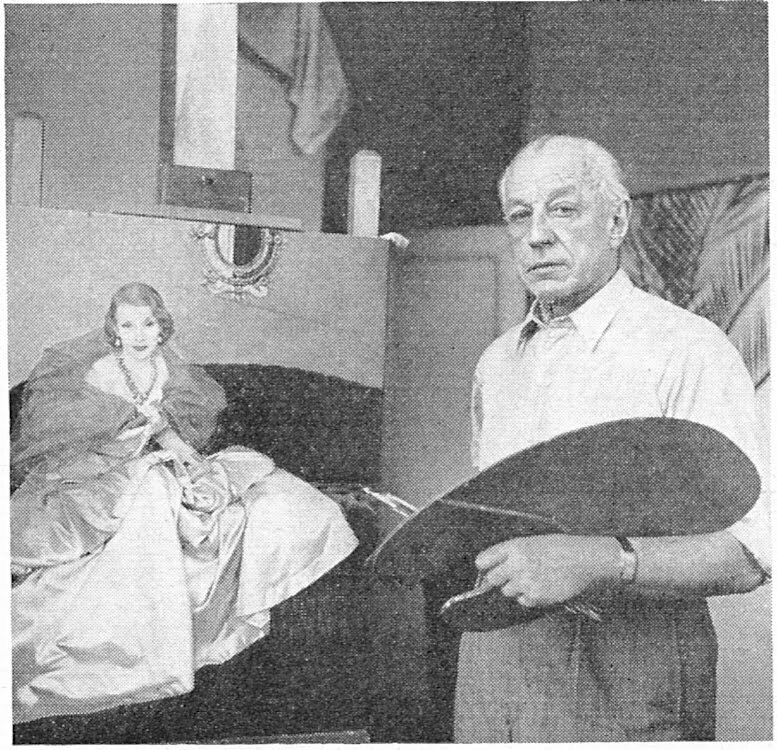 Mark Drew applying smalt to wet paint in the Parlor Chamber of the Warner House, using a glitter gun (photograph from The Warner House, a Rich & Colorful History, edited by Joyce Geary Volk). Wallpaper? Sometimes I hate it, sometimes I love it. 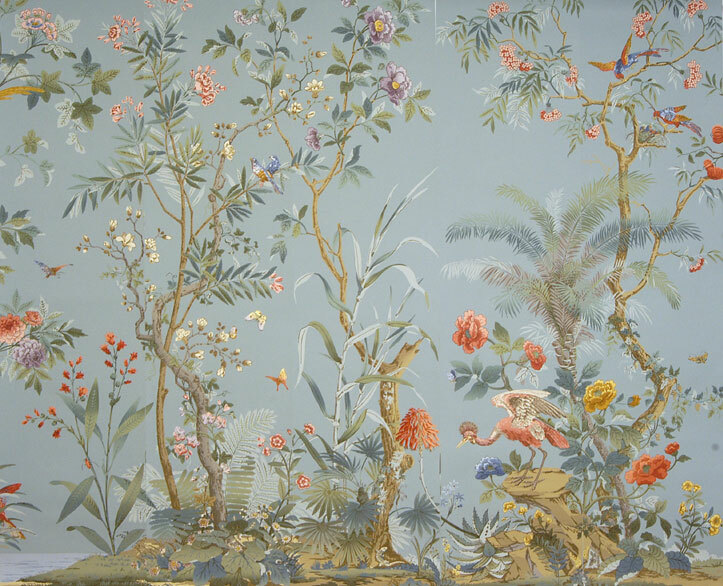 Here’s an instance of the latter, a hand blocked wallpaper by the venerable firm of Zuber & Cie, founded in 1797. 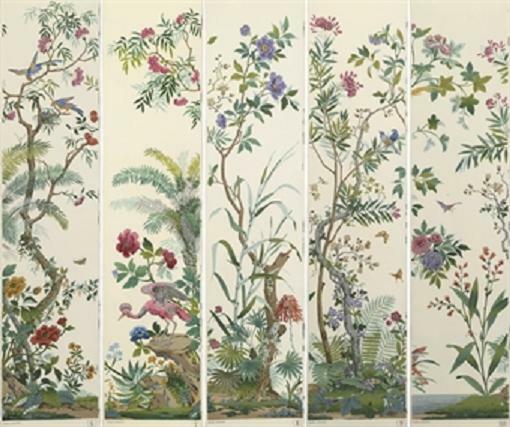 The pattern is ‘Decor Chinois’, originally created in 1832 in imitation of hand painted Chinese papers. 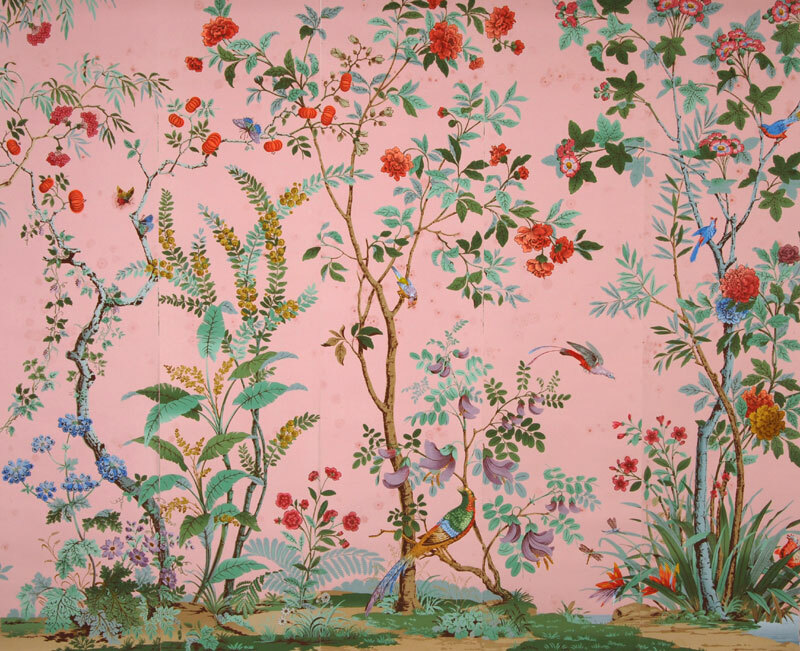 It was especially popular in the first quarter of the 20th century, and has been used by some of the great tastemakers of that era It was an especially popular paper for Colonial Revival decors. 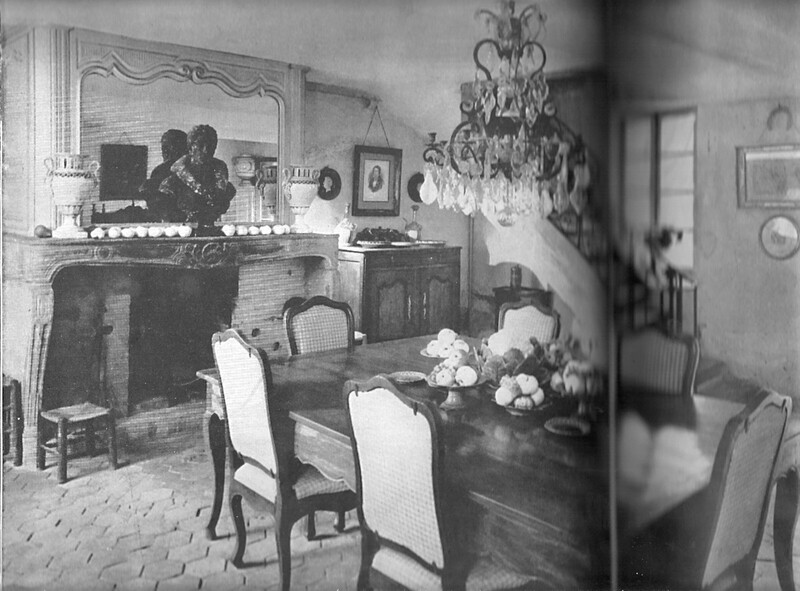 ‘Decor Chinois’ in competition with an Italian neo-classical mirror in Edith Wharton’s Dining Room at 884 Park Avenue in the late 19th century. 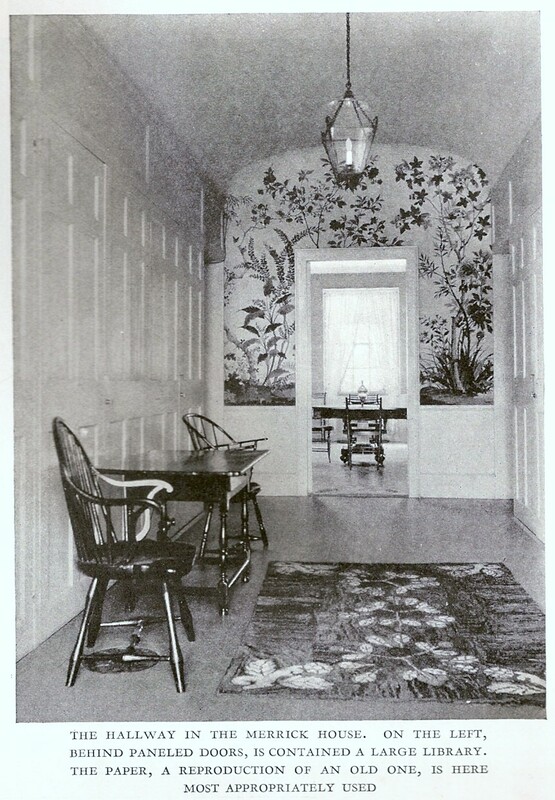 A charming use in the front hall of the Merrick House in Hallowell, Maine, built 1800, as featured in House Beautiful in the 1910’s. The caption gives ‘Decor Chinois’ the seal of approval. Romantically used in the second floor room of the tea house at Martha Codman Karolik’s Berkeley Villa in Newport, RI. 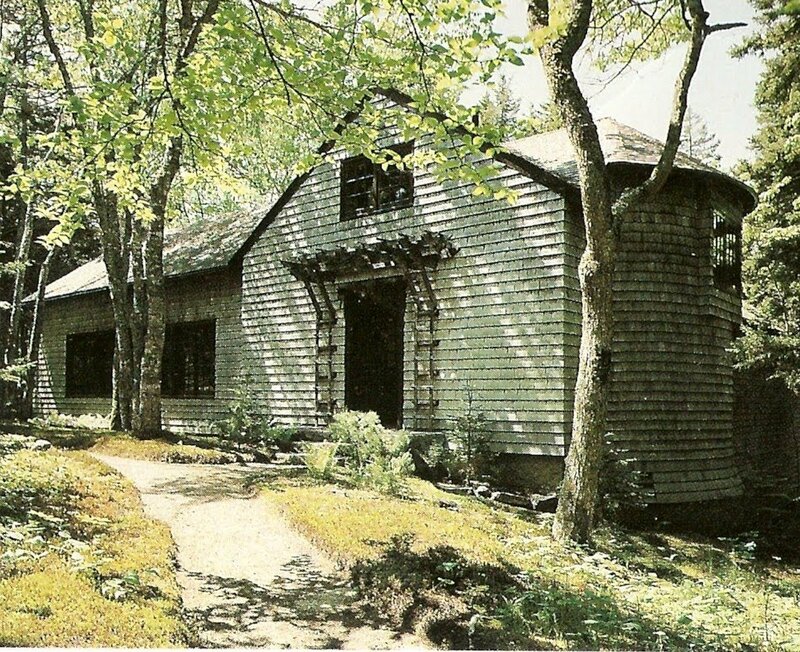 The tea house is a 1920’s copy by Fiske Kimball of the famous Derby summer house by Samuel McIntire. Having finished disposing of the usual Christmas trash, I am now moving about 700 books from one location to another in the house. It is mostly a pleasurable task, coming across old favorites, appreciating the design of others, to say nothing of floor space freed up in the tiny sittng room that the books are leaving. . There is however, a tiny blot on that happiness, and I am going voice another book design peeve to add to the list: Books that are longer than they are high, particularly if they are published only in papercover. It may be a lovely design conceit, especially if one is featuring very horizontal images, but most would be as well served if they were in a regular vertical format. Why do they peeve me? 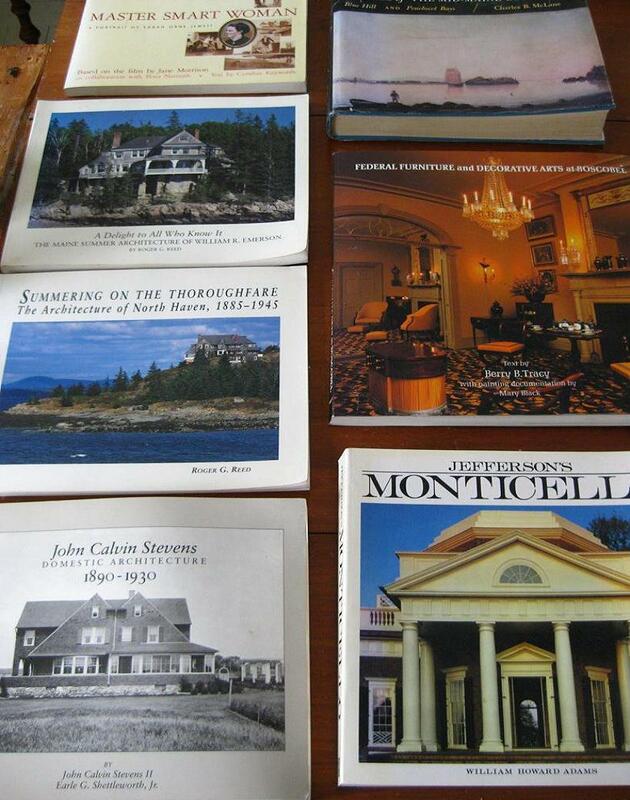 The coffee table books thus designed cannot be shelved in a regular depth shelf. Nor, for that matter can some of the smaller ones (half folio and smaller). 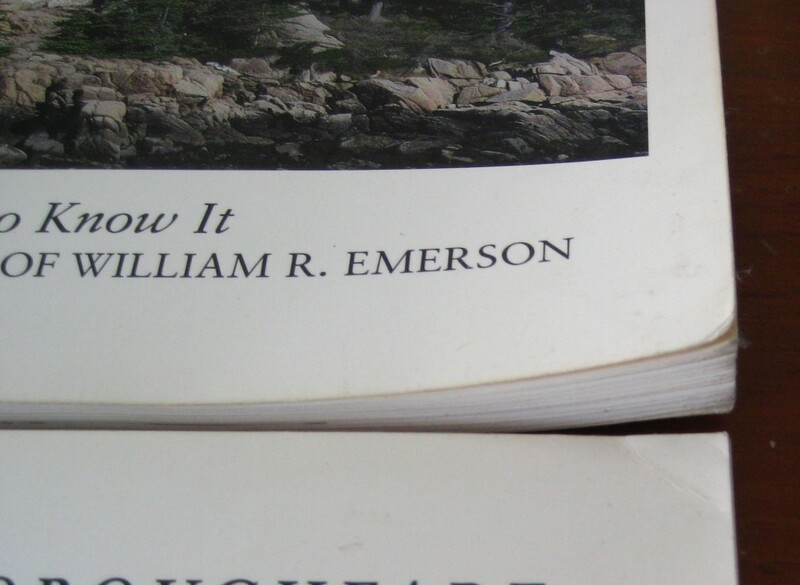 The paperback volumse inevitably fan or warp open on the edge while shelved. I’ve tried everything over the years—laying them flat (they still curl and warp), shelving them together, even if it puts them out of category (see laying flat) putting them between larger volumes (there’s still always an inch that fans out), weighting them down with something ornamental (it doesn’t really serve a book well to have a terra cotta architectural ornament resting on it), and the most drastic solution, giving them to the library book sale. Additionally, the exposed edges get dirty (yes, the shelves do get dusted). Wonderful custom slipcases would be the answer, but damn those taxes and new roofs. A few of the offenders, favorites all. Oh, and pet peeve #3: I have quite a few paperback monographs, some without titles on the spine. Give me a break. It wouldn’t take that much more ink. Then I could locate them on the shelf easily. Duh. There, that’s off my chest. Back to sorting books. Hope you all had a happy holiday. I did. Good company, good food, good drink—-the first two almost to happy excess, the latter in sensible moderation. Yes, you read correctly. Smalt. Read on. 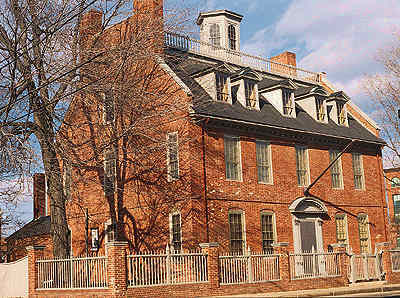 One of my favorite houses is the McPhaedris-Warner house in Portsmouth, New Hampshire, built by a merchant-privateer in 1718, and one of the earliest brick houses in New England. 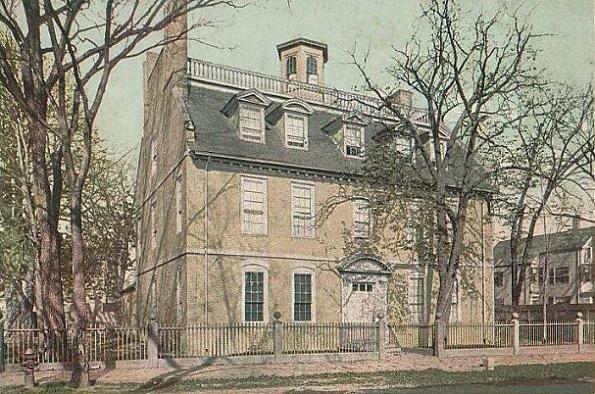 A noble Georgian presence near the harbor, it has all the appearance of a fine townhouse in a small English city, and was the inspiration for many a good brick colonial revival house in the suburbs through the early 20th century. 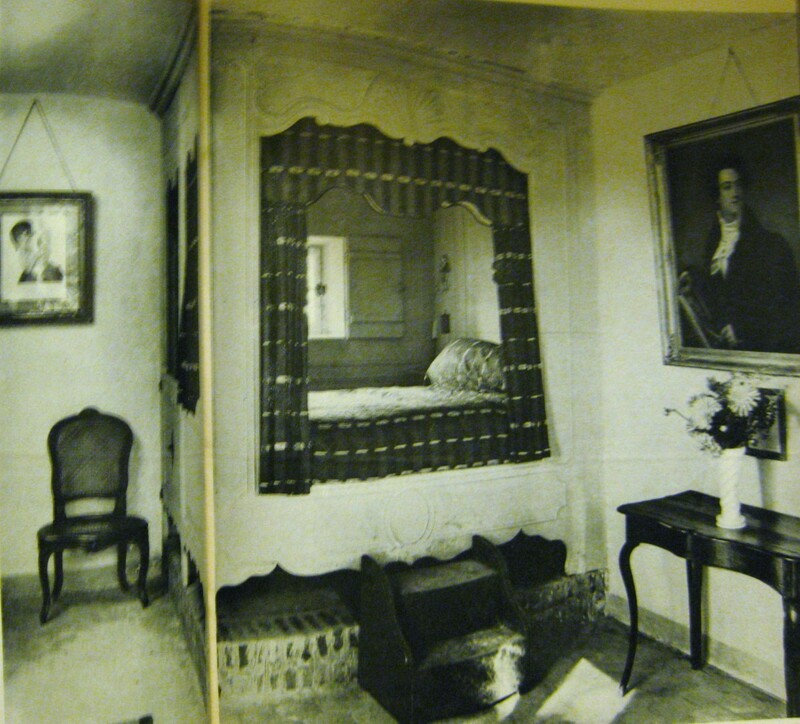 Inside are handsome rooms, high and richly paneled. 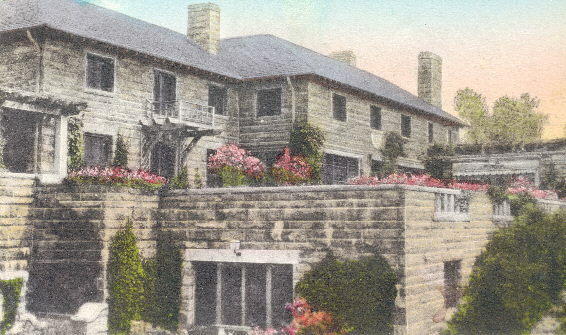 The house remained in the hands of McPhaedris’s descendants until the early 20th century, when the last of the family, Evelyn Sherburne, deeded the house and extraordinary contents to the Warner House Association, which has maintained it ever since. 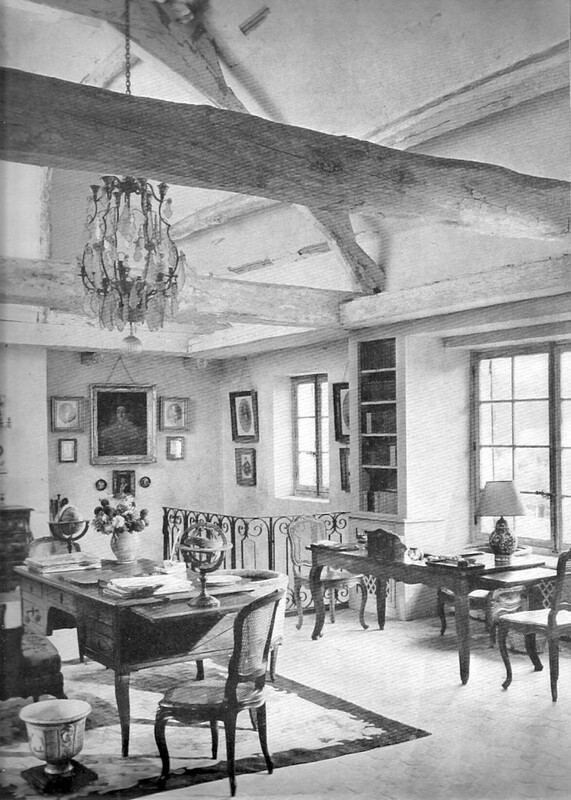 The interiors have that romantic, rich flavor that only the accumulation of generations can give. The hall has crude and enigmatic murals, the earliest in America to survive, with life size Native American chieftains flanking the huge arched window on the stair landing. The dining room has interesting graining and marbleizing on the paneling. The Warner House Association have been conscientious stewards of the property, maintaining it well. In recent years, given the rich primary materials available, the curator, Joyce Geary Volk, clearly a person both erudite and imaginative, has restored different rooms to reflect varying periods of occupancy. The drawing room is particularly evocative, restored to its Colonial Revival/ late Victorian appearance as Miss Sherburne had it. But we’ll return to all that in a future post. Today’s post is about smalt. If anybody knows what smalt is, please raise your hand, but don’t tell the others. I didn’t know smalt from s’mores until I saw this room. Continue reading. An essential component of restoring an historic room is a chemical paint analysis, in which layers of paint are studied and broken down under a microscope to determine pigments used, to arrive at the colors for the desired period. 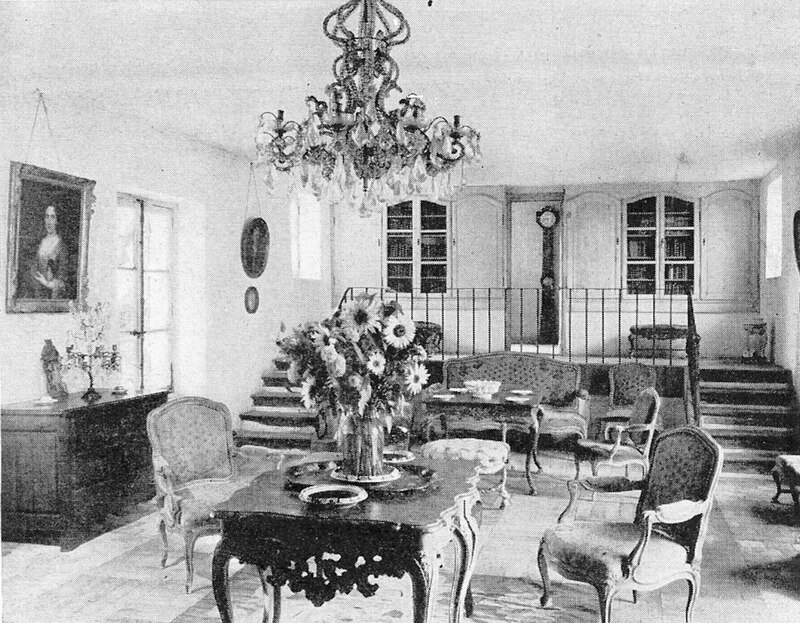 One of the early examples of this was the dining room at Mt. 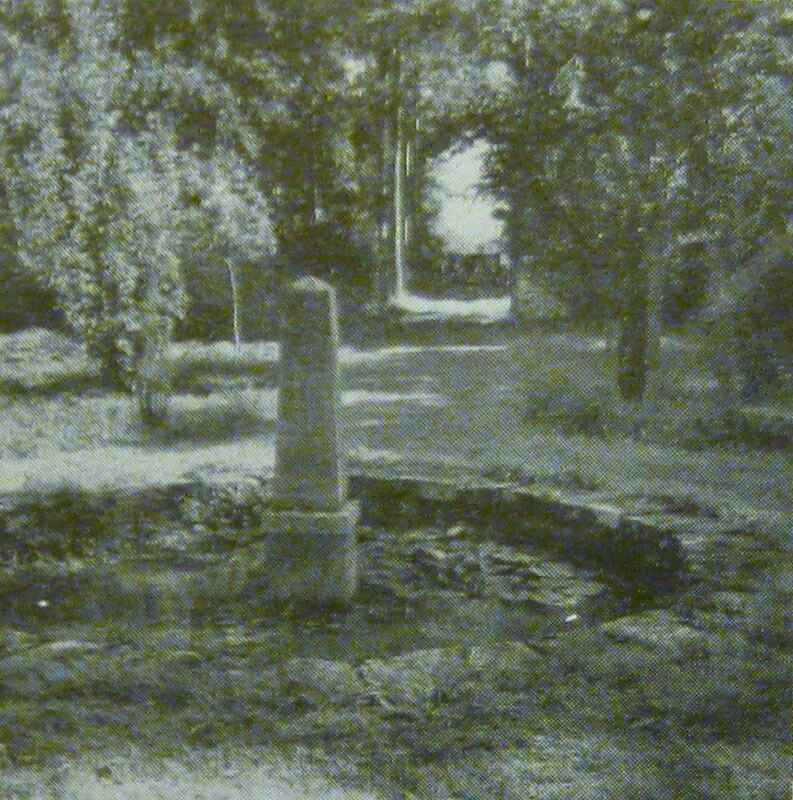 Vernon a couple of decades back, where it was found that verdigris in the pigment indicated an almost surreal shade of green originally covered the walls. 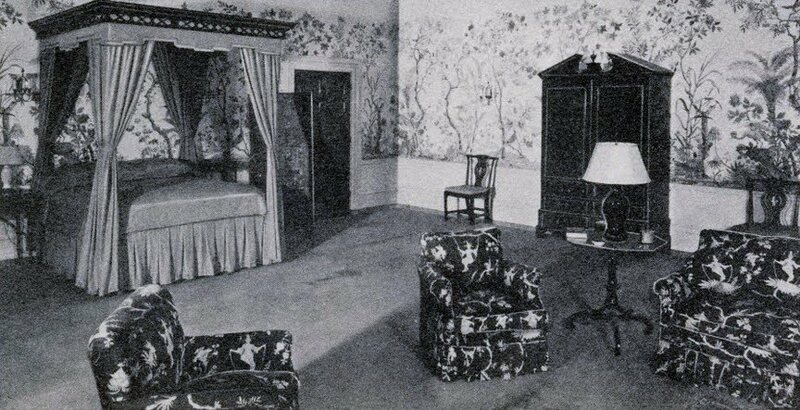 When a routine analysis was undertaken for the Parlor Chamber upstairs, a great surprise was in store. One of the earliest layers of pigment was found to contain smalt. For those who did not raise their hands, Smalt is ground cobalt blue glass. It is most typically used in sign painting, to create the rough background surface one sees in older signs. At the Warner house, the smalt was found to be of a particularly fine grain. 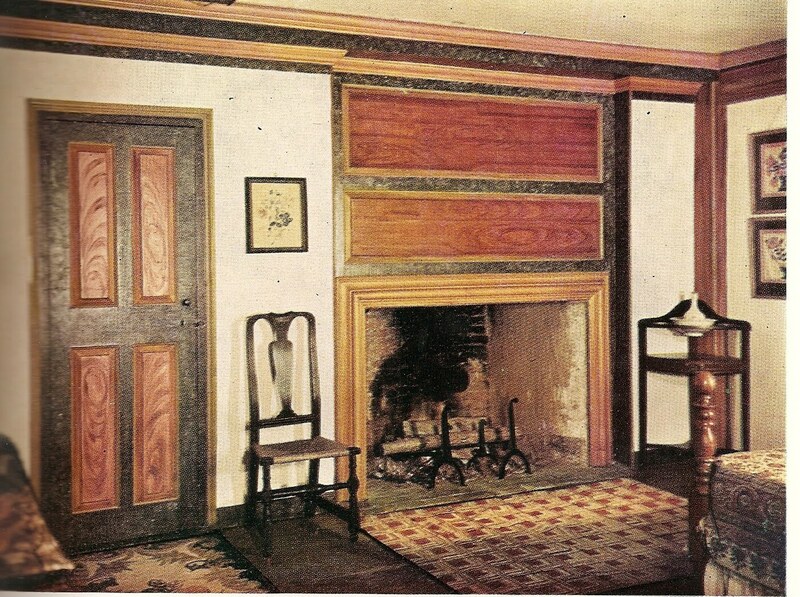 Although there were isolated instances of smalt being used for highlighting details of interior woodwork in England, this was the first time that researchers had encountered it in America, and the first time in an entire room. I recently visited the Warner house for the first time in years. The tour was wonderful, given by an actress of talent playing Miss Sherburne, taking one through ‘her’ house and its history—lively, and not at all as corny as it sounds. A giant improvement it is over the usual dry house tour given by well intentioned docents reading off long facts..
As we went up the stairs, and into this beautifully proportioned room, richly paneled, with its large deep windows of wavy glass looking out to the Portsmouth Harbor, I stopped breathing for a second. It was like nothing I’d ever seen, and photographs cannot capture the ethereal effect; it has to be experienced to fully appreciate it. The paneling had a low sort of luminescence, enhanced by the light from the river. The color is difficult to pin down, sort of taupe/violet/mauve from the combination of a blueish green base shot with the cobalt smalt. 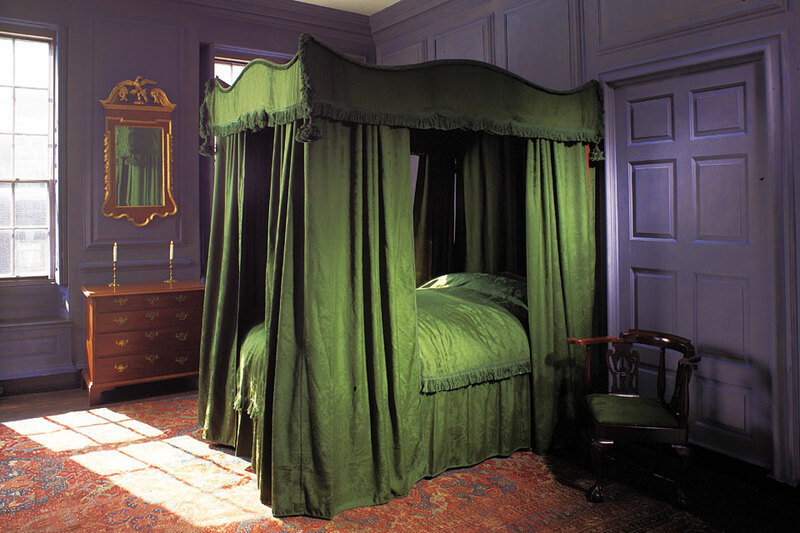 The already extraordinary effect was heightened by the reproduction of the original bed and curtain fabric, in a rich emerald green brocade. It must be extraordinary by candlelight. The surprising combination of these colors and textures, with rich old San Domingo mahogany furniture, has to be seen to be believed. Sometimes one sees something that challenges pre-conceived notions, and this is one of those instances. 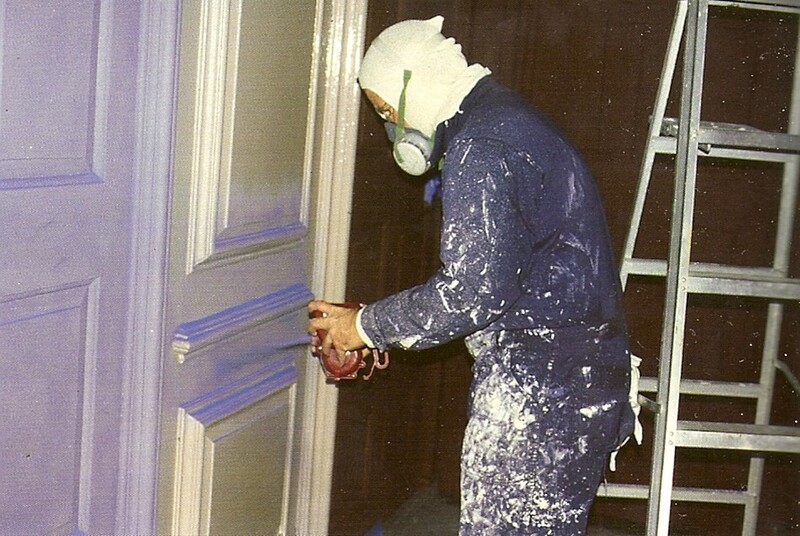 Note to readers: Although this puts to shame the gaudy and expensive paint effects various Park Avenue acquaintances have been allowing their decorators to smear over their walls for lo these many years, you should not try this at home. Really, you shouldn’t. 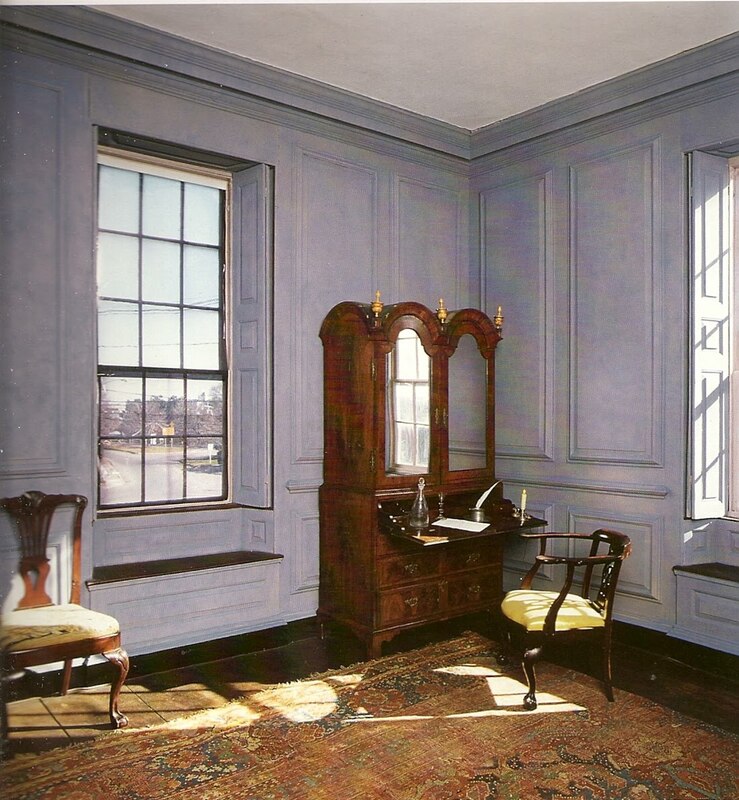 Unless of course, you have gorgeous 18th century paneled rooms that garner light from nearby water…. Proust Bite: Teatime at My Grandparent’s. The bottoms of these cookies are very shiny from the caramelization of butter and sugar, and my grandfather loved to remind novice visitors to be sure to ‘peel off the wax paper’ before taking a bite, and derived almost sadistic enjoyment from watching the hapless souls try. Cool thoroughly on foil. When cool, peel off foil. Thanks to the Blue Remembered Hills for the kind mention yesterday. It is more than flattering to have my favorite bloggers stop by. It is snowing fiercely today, so I’m housebound, and torn between cleaning up a gigantic desk mess, or browsing through picture books, I’ve chosen the books, fully aware that I’ll pay later, when the piles on the desk fall over on the floor, or they spontaneously combust. 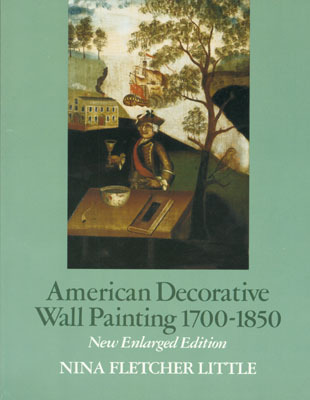 The book that has most caught my attention this afternoon is an old favorite, American Decorative Wall Painting, 1700-1850, by Nina Fletcher Little. You may wonder how the Dilettante acquired his fascination for design sources. 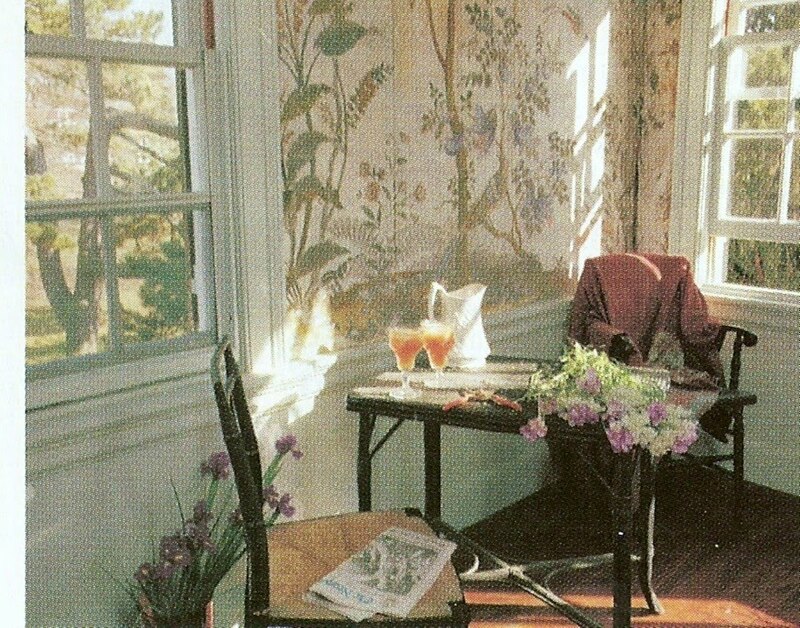 Well, it was as a little lad, sitting inside on rainy days, alternately reading Nina Fletcher Little or the Hardy Boys—-when my nose wasn’t poked deep into the chic, lush photos of House & Gardens Second Book of Interior Decoration, but that’s another post. I always looked forward to her many magazine articles, amazed by her resourcefulness and intellect, her new discoveries, and her excellent narrative style, which kept the subject from being dry. One shared her enthusiasm and sense of discovery, and from her writings, I learned a new way of considering objects and their place in the world, and developed my own curiosity about design sources. With her husband, Bertram K. Little, for many years the Director of Historic New England , the organization formerly known as SPNEA, she formed an extraordinary and pioneering collection of New England Folk art. The Littles displayed the collection at their summer home, Cogswell’s Grant, an impossibly romantic 18th c.
New England farm hidden away at the edge of the marshes in Essex Massachusetts. 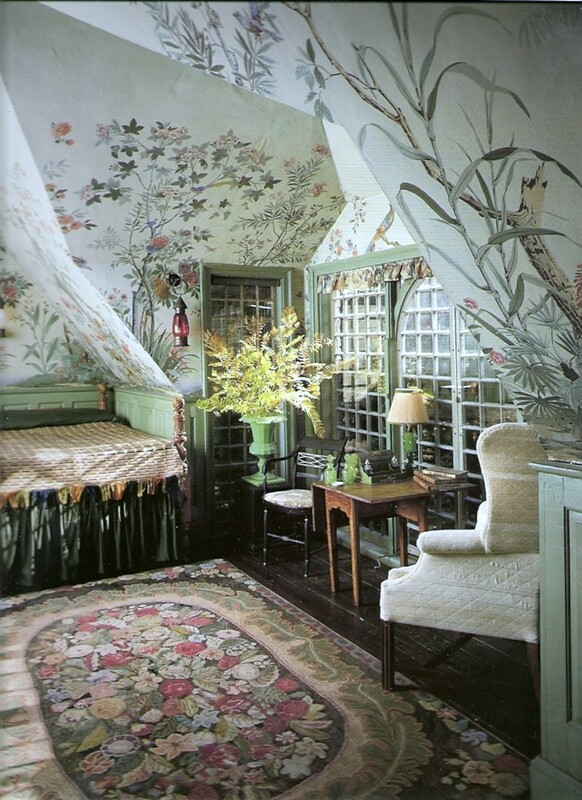 Although ‘country’ and ‘folk art’ are two words that can make my blood freeze when spoken of as interior decoration (all those painted goose cutouts, those herbal wreathes, those homespun checks…ugh), the Little’s collection was something else, almost spiritual, as displayed in the timeworn old farmhouse. 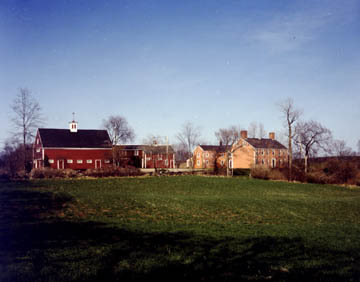 At their deaths, both in 1990, The Littles left house, farm, and collection to Historic New England. 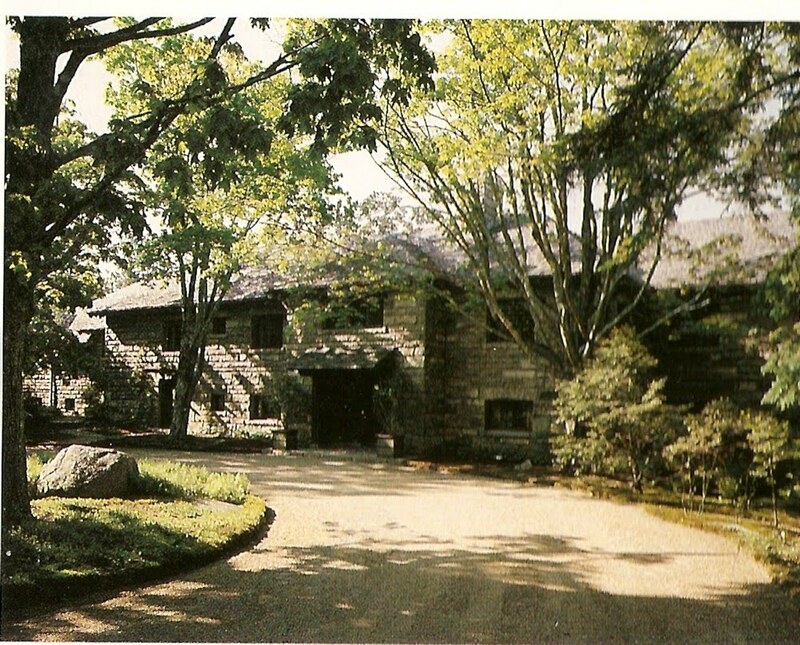 Historic New England is also the steward of famous Beauport, a few miles down the road in Gloucester. The two are well worth a summer road trip, to experience two highly personal presentation of the decorative arts of New England. 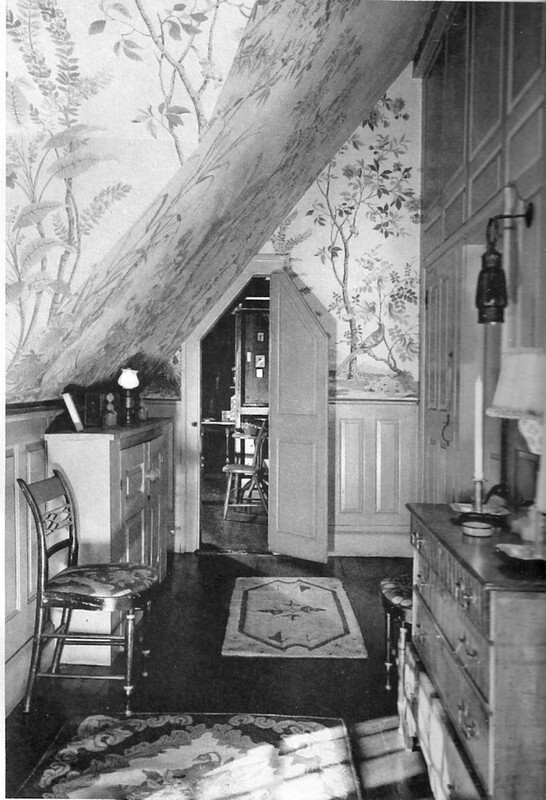 A bedroom in the Little’s country house, Cogswell’s Grant, with the 18th century grained and marbleized woodwork that sparked her interest in early wall decoration. FOOTNOTE: Here is one of my own ‘eureka’ moments. This is a little painting that I can’t live without. 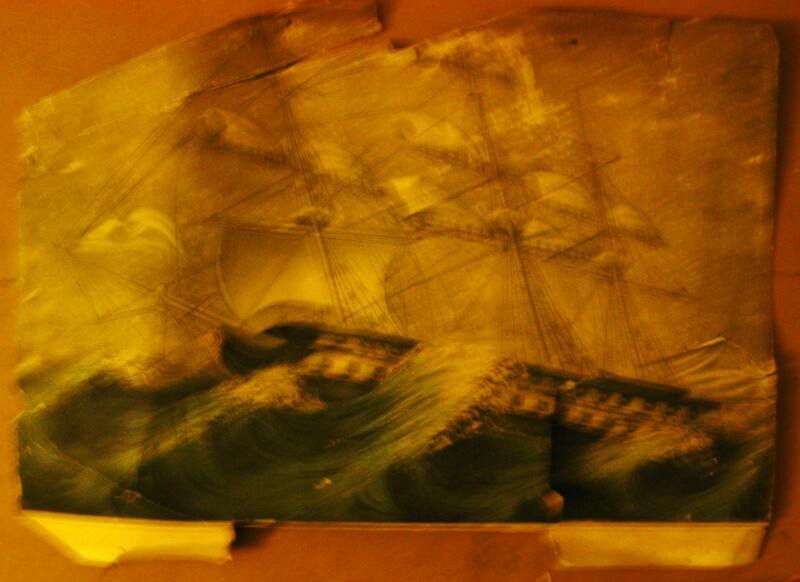 It is a small primitive oil on canvas, very shabby, of a shipwreck, by some anonymous 1850’s painter. I bought it at the age of 14, at a country auction I attended with my father at a run down Charles Addams-ish Victorian mansion in Hampden, Maine. 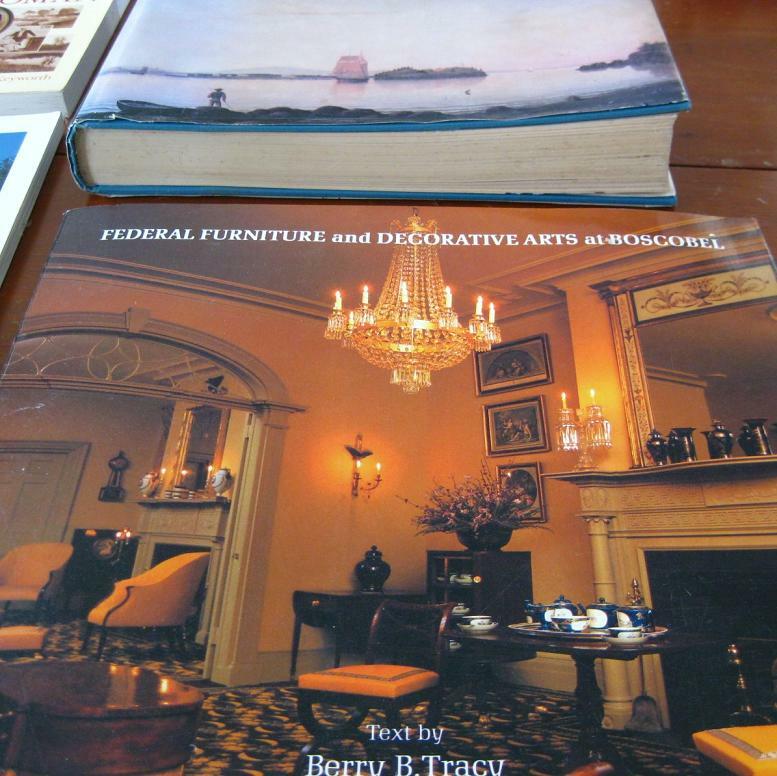 The auction was mostly the usual banal carved mahogany furniture and gold bordered china one would expect in railroad president’s house. Sitting outside on the unshaded lawn, getting the worst sunburn of my life on my knees, I watched the usual buffets and gilt mirrors go up, when suddenly, a very dirty stack of small paintings came down from the attic. They were mostly ho-hum Hudson River style landscapes. This one was on the bottom, and it was love at first sight—the almost abstract composition, combined with sure brushstrokes, skillfully rendered dawn on the horizon, and vividly real storm colors. For $11.00 the stack was mine. 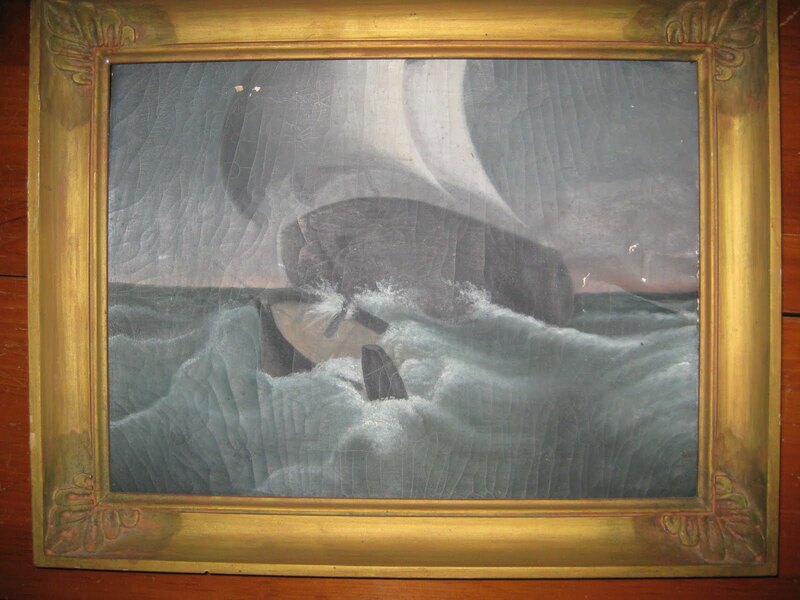 I’d lived with the painting for 25 years, when, in the course of removing antiques I’d purchased from a house a mile from me, this tattered Currier & Ives appeared folded in a pile of papers in the attic. Imagine my surprise. I’d found the source of my painting.